In fact, the idea of decline is one thing the extremes of Left and Right agree upon. Julian Assange, avatar of apocalyptic populism, gets kudos from neo-Nazis and social justice crusaders alike. He noted to one reporter how American power, source of the planet’s evils, was in decline like Rome’s. ‘This could be the beginning,’ he whispered with a smile, repeating it like the mantra of an avenging angel. 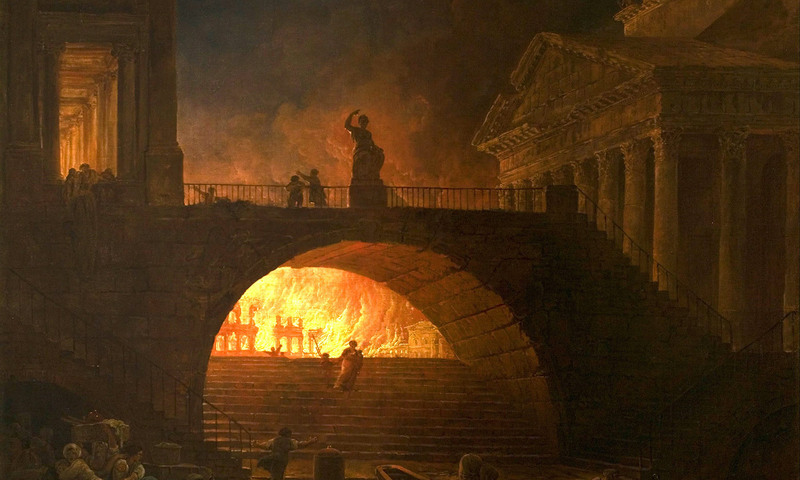 Rome’s decline looms large as the precedent. So, world historians have played their part as doomsayers. At the same time as the English historian Edward Gibbon’s first volume of The History of the Decline and Fall of the Roman Empire (1776) was published, the American colonists said good-bye to their overlords; some read that as an omen. The First World War brought endism into the modern age. The most famous rendition was the German historian Oswald Spengler’s The Decline of the West (1918). The carnage of Flanders and the influenza plague of 1918 – which wiped out up to five per cent of the world’s population – made The Decline of the West more than timely. Spengler added a spin: he predicted that, by the end of the century, Western civilisation would need an all-powerful executive to rescue it, an idea that autocrats have seized upon with repeated glee ever since. It is almost part of the modern condition to expect the party to be over sooner rather than later. What varies is how the end will come. Will it be a Biblical cataclysm, a great leveller? Or will it be more gradual, like Malthusian hunger or a moralist slump? Our declinist age is noteworthy in one important way. It’s not just the Westerns who are in trouble; thanks to globalisation, it’s the Resterners too. In fact, we are all, as a species, in this mess; our world supply chains and climate change have ensured that we are poised before a sixth mass extinction together. We should worry less about our lifestyle and more about life itself. Declinisms share some traits. They have more purchase in times of turmoil and uncertainty. They are also prone to thinking that the circles of hell can be avoided only with a great catharsis or a great charismatic figure. But most of all: they ignore signs of improvement that point to less drastic ways out of trouble. Declinists have a big blindspot because they are attracted to daring, total, all-encompassing alternatives to the humdrum greyness of modest solutions. Why go for partial and piecemeal when you can overturn the whole system? Declinists claim to see the big picture. Their portraits are grandiose, subsuming, total. Consider one of the all-time bestsellers, the Club of Rome’s The Limits to Growth (1972). With more than 30 million copies sold in 30 languages, this ‘Project on the Predicament of Mankind’ gave alarmed readers a portrait of demise, mapped out with gloomy confidence about ‘feedback loops’ and ‘interactions’. In fact, it shared much in common with the good Reverend Thomas Malthus, including the obsession with diminishing returns. Fixated with the decline of arable land, Malthus could not see sources of increasing returns – at least not at first. Some of his friends eventually convinced him that machinery and colonialism solved the problem of too little food for too many mouths; later editions of his Essay on the Principle of Population (1798) went through contortions to figure this out. In the same way, systems analysts at the Massachusetts Institute of Technology simulated the whole world, but could not admit little pictures of ingenuity, problem-solving and adaptation – some of which had the perverse effect of unlocking so many more sources of carbon that we’d begin to bake the planet several generations later! One dissenting voice in the 1970s was Albert O Hirschman’s. He worried about the lure of doomsaying. Dire predictions, he warned, can blind big-picture observers to countervailing forces, positive stories and glimmers of solutions. There is a reason why: declinists confuse the growing pains of change with signs of the end of entire systems. Declinism misses the possibility that behind the downsizing old ways there might be new ones poking through. Why the allure of declinism if history seldom conforms to the predictions? To Hirschman, it was traceable to a prophetic style, one that appealed to intellectuals drawn to ‘fundamentalist’ explanations and who preferred to point to intractable causes of social problems. For revolutionaries, what awaits is a utopian alternative. For reactionaries, what lies in wait is dystopia. The result is an ‘antagonistic’ mode of thinking, a belief that history swings from one big, integrated, all-encompassing system to another. Compared with modest advances, compromises and concessions – how boring! – the magnificent vision of a complete overhaul has so many charms. The preference for the bold and the big has hazards. The inability to see unheralded achievements and hopeful signs in a frenzy to overhaul can often yield more destruction than construction. Hirschman had seen the toll of declinism before. Growing up in Weimar Germany, he watched his country fall prey to an ‘ideological trap’, and fork into extremes in the early 1930s, as Communists and Fascists agreed to tear down the republic in pursuit of their rival utopias – while disagreeing on everything else. Decades later, Hirschman observed how Latin Americans despaired about the prospects for democratic reform. Their slide into what he called ‘fracasomanía’ – the propensity to see failures everywhere – blotted out real, incremental advances and achievements that fell short of high expectations. And the reason they fell short was because Latin America’s decline had gripped democratic reformism. The result was to put more faith in ever-more extreme views and the temptations of direct action. Students at the University of Buenos Aires joined the ranks of urban guerrillas. At the other end of the spectrum, Argentine reactionaries bemoaned the end of Western civilisation and turned to paramilitary death squads. When the coup d’état finally came in March of 1976, the military junta baptised itself as the ‘process of national re-organisation’. As close friends slipped into hiding or fled, Hirschman felt pangs of déjà vu. He began to have nightmares about the ideological traps of his youth. When German publishers asked him to write a special preface to the German translation of his classic Exit, Voice, and Loyalty (1970), memories of Berlin 1933 came storming back. The problem with declinism is that it confirms the virtues of our highest, impossible solutions to fundamental problems. It also confirms the disappointments we harbour in the changes we have actually made. This is not to say there aren’t deep-seated problems. But seeing them as evidence of ineluctable demise can impoverish our imaginations by luring us to the sirens of either total change or fatalism.